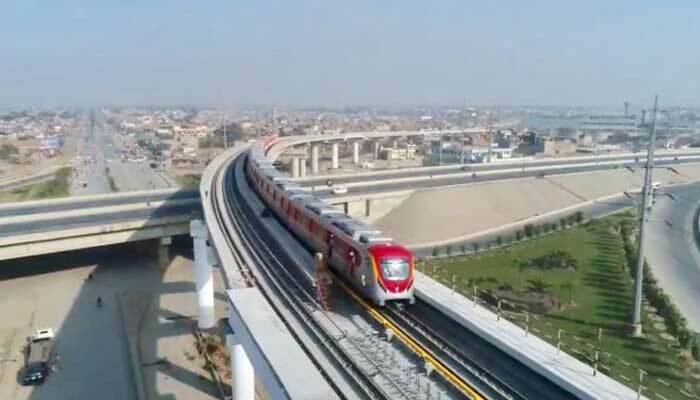 ISLAMABAD: Terming the Orange Line train project 'a gift for the people of Lahore' Chief Justice of Pakistan (CJP) Justice Saqib Nisar on Wednesday ordered contractors to finish work on the project by set dates. Praising the multi-billion rupees project, CJP Nisar said he would love to travel in the train after its inauguration. CJP Nisar made this remarks during a hearing of the case pertaining to the project, which was heard by a three-member bench of the Supreme Court headed by him. He warned that the non completion of the project on the announced dates will be considered as a contempt of the court. Meanwhile, Naeem Bukhari, the counsel of a contractor, informed the court that they are not being paid for the construction work, to this Chief Justice Nisar remarked that Lahore Development Authority (LDA) should deposit cheques with the apex court and the contractors could receive those cheques after providing bank guarantee. Bukhari also informed the court that a Chinese company would first finish interface work and then the local contractors would start working on the project. The hearing of the case later adjourned until January 16. Later, rejecting the rumours that the PTI government has plan to scrap the project, Aleem Khan, the Provincial Minister for local government assured that Orange Line project will be completed by July, 2019. The minister said: "We won't scrap the project. As many as Rs300 billion have already been spent on the project so it could not be closed now." Calling Nawaz Sharif king, Aleem said: "the king has left us in a great debt for years. We just want to minimise the losses." He further said that Rs120 billion will be spent annually on the Orange Line Project during the next five years. The Punjab government will have to spend Rs 10 billion per month, he claimed. He said once the Orange Train gets operational, it would cost a subsidy of around Rs 1,000 for each passenger which no government could afford for a long time.